Natalie Dawson is a contributor to Writers on the Range, the opinion service of High Country News. She is the director of the Wilderness Institute at the University of Montana in Missoula. I was standing on the Kerr Dam in Polson, Montana, this summer, along with 25 college students from Iraq, listening as a civil engineer described how the dam was built. He was followed by a Salish tribal member, who spoke about the cultural significance of the tribe’s ownership of the site. I cringed and prepared to step in, but the student, Pshtiwan, gracefully replied, “Oh no, sir, we are college students, of course I will go home. We are just here for a few weeks. Lots of us live in places that are just like here, normal, there’s even mountains. …” And they started a lively discussion about what life is like in Iraq. Again, I winced, holding my breath, but again, the student stepped up and explained politely, “I am Kurdish. Do you know about Kurdistan? It is different than Iraq; we are our own government, with our own flag.” The man paused, thought about it, smiled and said, “Iraq? Yeah, I love people from Iraq!” I let out my breath. I had just realized something important: that I needed to let go of the biases I held about my own people — rural Westerners. The visiting students hold their nation's flags during a trip to Montana. At first, the idea of shepherding Iraqi students around the public lands and small communities of western Montana seemed daunting. What could I possibly tell these students about life in a place like this, so remote and sparsely populated — different in so many ways from their native land? 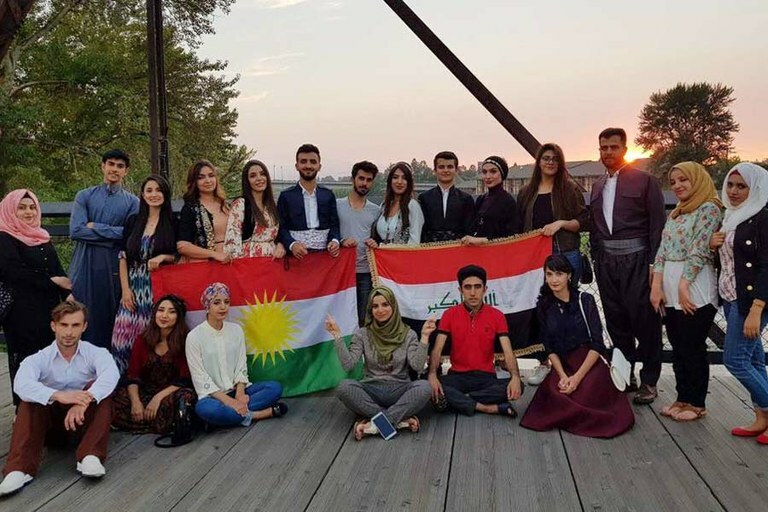 Chosen by the U.S. Embassy in Baghdad and the U.S. Department of State, these students have been identified as future leaders in the rebuilding of Iraq and potential independence of Kurdistan. Most of them had never been on a plane. Most of the women had never ridden a bicycle, gone swimming in a river, or even walked alone outside at night in the open air. The women and men had never played games together, but before long, we were on the Flathead Reservation playing a Native game called Chiriki stickball with Salish Kootenai college instructors. I realized, with time, that what I could give them is what this region gives to each of us every day, a sense of freedom and seemingly limitless open space. Space to be creative, to try new things, to ask big questions, to have discussions that they could never have in their home country, all while watching the sun set on the mountains of the Continental Divide. Most of our activities focused and occurred on public lands, including the Rattlesnake National Recreation Area and Glacier National Park. During one of our class periods, students watched a video about the Arctic National Wildlife Refuge, oil and gas drilling and its impact on the G’witchin people. 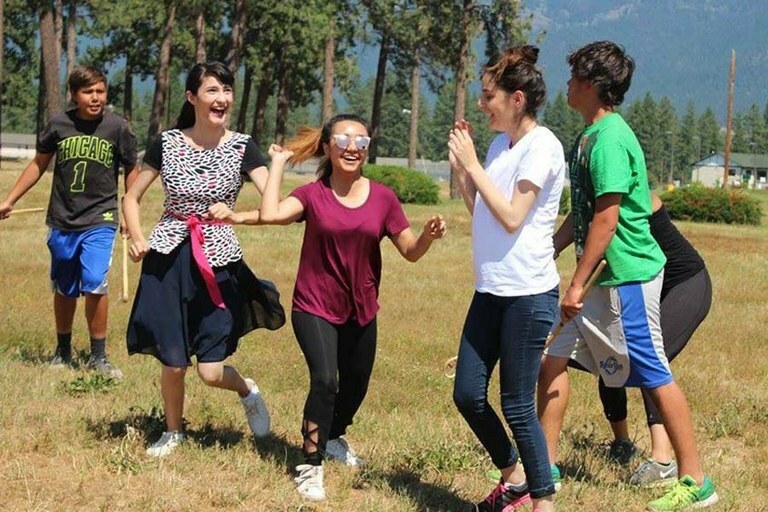 Kurdish and Iraqi students play Chiriki, a stick ball game, on the Flathead Reservation with Salish Kootenai college instructors. We are all just people. His words echoed in my mind when it came time for the Kurdish and Arabic students, all from war-torn communities and on opposite sides of conflicts at home, to leave. We hugged each other goodbye, and many of us cried. The student’s belief that We are all just people ran through my mind as I left the group at the airport, realizing how much they had changed several people’s view of the world, including my own. For the residents of the small Western towns that opened their arms to these students from the Middle East, the world got smaller as stories were shared with openness and kindness. Yet our worldview grew so much larger, too, like seeing snow for the first time in your life while standing at the top of a pass in an international peace park.